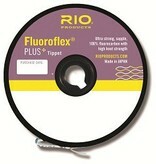 RIO Fluoroflex Plus is an exceptional leader and tippet material made from 100% fluorocarbon (PVDF). Fluoroflex Plus is the strongest, thinnest fluorocarbon on the market with an incredible strength. It is a slightly softer material than Fluoroflex and ties excellent knots.